I totally rediscovered the joy of sprinting, thanks to an old buddy of mine. My friend had asked me the other day if I could still run at a sprint. We had been talking about mobility the past couple days so it wasn’t as random a question as it might seem. I said, “Yeah”, but with a little hesitation. It had been a long time since I did a full on sprint, and I don’t jog at all. Jogging doesn’t help with my performance in any way except for when jogging, in my experience. So I don’t do it, even though it does give a great “high”. Sprinting, on the other hand, has always proven to be beneficial. So I went for a testing session two days ago to see if I really could still run at a sprint. I went out with my Earthrunner sandals and gave a couple tries on the sidewalk and street. Sure enough, it felt awkward and I got some stabbing knee pain. I knew I wasn’t doing something right. I went on a stretch of grass and took my sandals off. 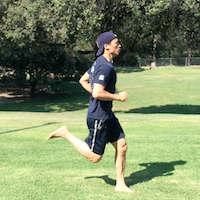 I took a few easy strides back and forth, feeling out my alignment between my feet, ankles, knees, hips, head, and shoulders. Eventually I got the sweet spots and graduated to several very good sprints back and forth. No joint pain at all, just fast, quiet, agile running. 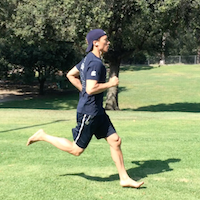 The core of the running motion is that it is a continuous series of twisting. We propel ourselves forward by cranking up the torque in our abdomen and torso, swinging our elbows in opposition to our legs. Arms are rotating torso counterclockwise, legs are rotating hips clockwise. These opposing forces create torque in the abdomen. Torque in abdomen is released through the left leg into the ground and propels a brilliant beast forward. Rotation begins in the opposite direction for both torso and hips. Arms and shoulders rotate torso clockwise, and legs rotate the hips counterclockwise. Torque is again created in the abdomen, this time in reverse. Full twist acting on the abs. The right foot is about to touch ground and translate force into the ground again, continuing forward locomotion of a brilliant beast. Absorb and release twisting power from your abs. Run with your abs, not your legs. Running is powered by the twisting mechanism of your shoulders and arms in opposition to your legs and hips. The center of that twisting torsion is your abs. Your midsection builds up torque from that twist, then releases it into the ground when your foot touches down. The mechanism then repeats in the opposite direction. Pillar Torso. If you follow my powerlifting newsletter, yes, this is the same concept as with squatting and deadlifting. A solid, quiet torso locked down by tight abs. I found this to increase the amount of torque in my abs. The more torque, the more power you can put out with each stride. Pull back your pectorals taut, and keep your ribcage down. Fists. Keep hands gripped tight into fists. This generates radiating power up to the shoulders and into the tension of your abs. Principle of kettle bell godfather Pavel Tsastouline applied to the sprint! Minimal movement of the elbows. No wild swinging. Just enough backward pumping to generate torque through the shoulders into the torso down to the hips. Knees forward. Pull your knees forward so that you are touching the ground with your feet directly under your center of mass on every step. Springy feet. 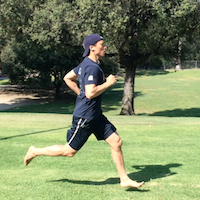 Your forefoot should touch the ground first, not your heels. 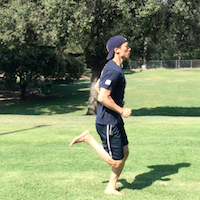 If your heels touch down afterwards, usually during slower pace running, then so be it, but the initial ground contact should be with your forefoot (the balls of your feet). Head in line. Notice when your head bends down too far to look at the ground, or tilts up when you are tired. Keep it in line with your spine, straight so that you can see ahead and slightly down when you need to track the path in front. Landing foot places directly beneath your center of mass. This is the tricky one. In the third frame below, you can see my foot actually lands just in front of my center. This is something I’m going to try to improve. Depending on how f’d your running form is, start super slow. Barefoot in good flat grass is ideal. You will be amazed at how quickly your body picks it up from there. And if anything hurts, stop, study, adjust, and retest. Don’t keep hurting yourself. You may need to do some mobility work to straighten your torso out, get your shoulders functioning, and hips and knees loose. I recommend using techniques laid out by Kelly Starrett in his book Becoming a Supple Leopard. Test out very slow running first and then put some work in where needed. Do you run? How? When? How often? What does it do for you? Let me know, because I’m trying to build this into my life now that I’ve rediscovered it. Thanks Eliot for the inspiration. Sprinting’s awesome. When I ran track, our coach always told us to let our jaw hang as loose as possible when sprinting all-out, and showed us videos of the fastest sprinters in the world in slow motion looking like their mouth was flopping all over the place. This fits in with the idea of running from your core, the rest of your body should stay nice and loose. It’s a common tendency to tense up and actually slow yourself down. A weird little tip, but for some reason it always helped me. What an amazing tip! I’m going to have to try this next time. Thanks for yet another awesome comment.